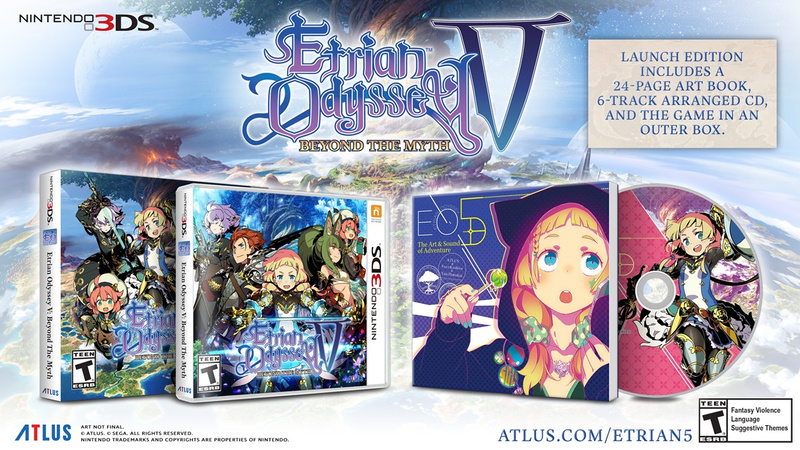 Atlus has revealed the contents of the Etrian Odyssey V launch edition, which will come as good news to those of you who just can't get enough of your limited edition packaging. When the 3DS title launches later this year you'll get a 24-page art book containing "beautiful character art and concept sketches by the illustrious Yuji Himukai." Also included is a 6-track music CD featuring songs composed by the one and only Yuzo Koshiro (Streets of Rage, Revenge of Shinobi, ActRaiser). Last but not least, there's the outer box, which "protects the precious treasures it holds within." Wil you be ordering one of these editions? Post your thoughts below. I love when they throw in extra incentives. That said, I've tried these games in the past but could never stay hooked for long. Though no fault of the music and story. I love the music in these games. Would pick it up if it ever comes to Europe. Etrian Odyssey Untold was a great time. I CAN'T WAIT! Its been over 4 years since IV and my body is ready!! SO STOKED! Wish they had a bigger OST though. This game was already a must buy for me. It'll also be one of the last 3DS games I buy; my backlog is big enough as it is, and the ability to play on a TV is compelling enough that I'm growing less interested in non-Switch games. Whens this come out does anyone know? I'm definitely getting the game but come on guys, 6 songs, and 20 sketches that's rather weak. So many Atlus limited editions for me to track down. I have Persona Q, then I've got Rodea, Harvest Moon, Bravely Second and Kid Icarus all in limited edition on 3DS. God knows how many more I now need to track down. I hope Europe will get this too. Yeah, I preordered this the day it was announced. I rarely preorder games, but I usually make an exception for Etrian Odyssey. I love those games so freaking much. I have not played this series before but it looks interesting. They should do dual releases. 3DS and Switch. Maybe it's due to the amount of clutter at my place, but I've not been so interested in getting the special edition as I used to. This one is very tempting though. And all without a $10 price hike over other 3DS games. This is probably my most anticipated game of the year. I LOVE these games. I've tries other dungeon crawlers on the Vita, but nothing has this series' style, sense of discovery and adventure, or production values. @JJ286 How would that work? This series was made for the DS, 2DS and 3DS line. @MegaTen For somebody whose nickname is "MegaTen", not having a 2DS or 3DS system is... strange. You ever think about making a journey deep into the 2DS/3DS ecosystem? @Mahe This game was obviously built on the 3ds but going forward etrian odyssey can work on the switch so I hope they continue it. The game would need some slight modifications but nothing terrible. Basically keep the mini map visible on the main screen, and have a quick switch to map mode. With proper button controls you could still draw the map just fine. It bugs that there's a launch edition announced but no solid release date. @Mahe they can always make it work. I reserved before remembering it's an Atlus game, so it's probably going to cost at least $10 more than a typical 3DS game. Am I getting this stuff for my extra 10 bucks? @KingMike It's only $39.99. Atlus tax seems to be a thing of the past. Just another nail in my spiked coffin when it comes to Atlus games. Fortunately I'll be getting the game, but no chance of Europe getting that sweet launch edition. Not to mention, Atlus games are almost perpetually on sale in the 3DS eShop. @SmaMan They used to be. That doesn't seem to be the case since they were acquired by Sega. Which is actually fine by me: I'd rather they not subsidize sharp drops in price by hiking the prices of their games for early adopters. Punishing your fans who loyally buy your games at launch seems counter-intuitive to me. Better to rarely have sales and sell the games for $39.99 like every other Nintendo 3DS game out there. @AlphaElite No, the map-making is core to EO's identity as a series. It's not the only good thing about it, obviously, but it would be a shell of its former self with it. @Ralizah @AlphaElite I wouldn't mind if the series did a slight graphic upgrade and made us play on only the handheld part. It wouldn't be the first game that's handheld only. Let us still draw our map if we like. They have also been doing auto map since the untold series so if you choose you can do that now but you have to turn it on in the options. @MegaTen What's best is that it's $40 USD-- not Atlus tax in sight! @AlphaElite Mapping is a key part of the series identity. Turning on auto-mapping in the 3DS games illustrates that; not having to regularly look at and update your map messes with the pacing and overall feel of the game. @Spoony_Tech This will actually be my first "main" EO game, having started with and greatly enjoying both Untold games. they finally did all the remakes for the 3ds when the 3ds is on it's way out. guess we can expect switch remakes in a couple of years? or maybe they'll do them all in one BIG BANG for the switch. @CrazedCavalier Wait what?? You need to play EO IV now. That's still in my top 5 3ds game! The addition of the overworld alone was a series first and implemented excellent imo! I feel like I'm missing something in regards to Etrian Odyssey. It seems like something heavily praised and that I'd in theory like, but I had the first one and just didn't remotely enjoy it. @Lizuka The first one is incredibly difficult and rough around the edges. It was straight-up old school dungeon crawling. Even now, it's not for everybody and it took me some time to really get into it. @Lizuka EO2 was significantly improved over EO1, EO3 was not as good as 2, EO4 was almost as good as 2, and EO5 is arguably the zenith of the series thus far. EO1 & 3 in particular had the most ridiculous amount of challenge and hurdles for newcomers, it's no wonder you didn't like the first one. I'd say EO2 Untold and EO5 are the ones to get at this point. @Spoony_Tech Auto-mapping is an option for people who really don't want to generate one themselves, but that's a far cry from that being the only or default option for the series. Like I said, if Atlus can somehow maintain the same sort of gameplay on a single-screened device, then i'd love to get more of these games, but I just don't see how it's possible unless you're forced to do something annoying like pull up a separate map screen every five seconds. @PlywoodStick EO2 was an incredibly unbalanced game. I love the original trilogy, but the only one that really holds up to the later games at this point in terms of balance is EO3. EO4 is the pinnacle of the series for me, what with that amazing overworld you're able to explore. @Lizuka Everyone doesn't enjoy the same things. If your problem was the lack of story and characters, try EO 2 Untold, which has a really good story campaign. If your problem was the difficulty, try playing EO4: even on the hardest difficulty setting it's still pretty approachable. And, as I said before, you're not stuck in one dungeon: there's an entire overworld to explore. Just pre ordered this, pure RPG quality.